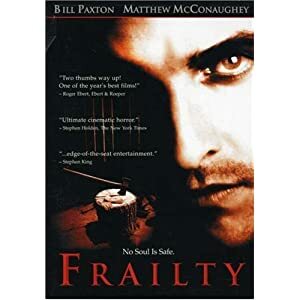 One of my personal all-time favorites, Frailty is an excellent psychological thriller. It is a story about dark religious devotions. There's hardly any blood and gore, but that doesn't make this masterpiece any less scary. Bill Paxton both directed the film and stars in it. Bill Paxton plays the loving father of two young boys. He believes that God has given him a list of demons that have taken human form and are living in his community. God wants him to kill the demons. The father enlists the help of his two boys and, with his trusty axe, sets out to do God's work.